This series utilizes the power of questions. Questions have the unique ability to direct our thinking. Often we get stuck in a negative pattern of thought and grow helpless; we just cannot break from it. Questions can come to our rescue! They have the exceptional potential to create mind-shifts instantaneously. In this series I will be using one question format in various contexts to demonstrate the power of questions and to help you and myself utilize this power in matters of great importance. I tried my best to keep the language simple and straightforward in order to make it an easy and enjoyable read as much as it is beneficial. It is quick snack you can have on the run without having to exert so much thought…enjoy it! What if you truly trusted Allah? If you truly trust Allah your heart would be at peace, you would find contentment and happiness in the fact that Allah is in control! If you truly trust Allah you would see the tremendous effect this has on the world; this trust is consequential, not merely mental! Allah says in the divine hadeeth: ((I am to my servant as he thinks of Me)). In other words, Allah will meet your expectations of Him. Why live without utilizing this tremendous power? If you truly trust Allah you will ultimately reach your goals and achieve your aspirations. Allah’s Messenger (PBUH) said: ((By Allah if you achieve true reliance on Allah, He would provide for you just as He provides for birds; they come out [of their nests] with empty stomachs and return later with their stomachs full)). If you truly trust Allah you would realize that He would guide you to what’s best for you! You have no need to motivate yourself per se. When you link your heart to Allah, your soul will mysteriously awaken to what you should do with your life. You would learn to listen to the lone voice in your heart telling you what you were created for. When you trust Allah you would know He put in you a navigation system to direct you to your best possible path, just as he guides a bird to build its nest and feed its little ones, just as he guides a butterfly to break from its cocoon on a tree branch in Brazil and travel to Nova Scotia in Canada, then return to the same tree, same branch with no map or GPS assistance. If you truly trust Allah you would know that your current circumstances are intended for a noble reason, and are the best option among all other counter-factual possibilities. If you truly trust Allah you would know that Allah’s plans for you are better than your plans for yourself. And this doesn’t mean you don’t study, plan, and execute. Rather this all goes hand in hand in perfect harmony and can only be achieved when you trust Allah at a deeper level and learn to listen to the voice of your heart; only then you will live out your perfect plan. If you truly trust Allah you would know that His judgment is the best there is. You would trust His wisdom in His guidance and realize that what He commands us with is in our own interest. Trust Allah and live in peace! 0 Responses on What if? # 1"
Reblogged this on Islamic Writing. Assalamu alaikum. Wonderful article and to the point, The points you mentioned are really the core of of the kind of questions that people ask regarding trusting in Allah. I have a question. 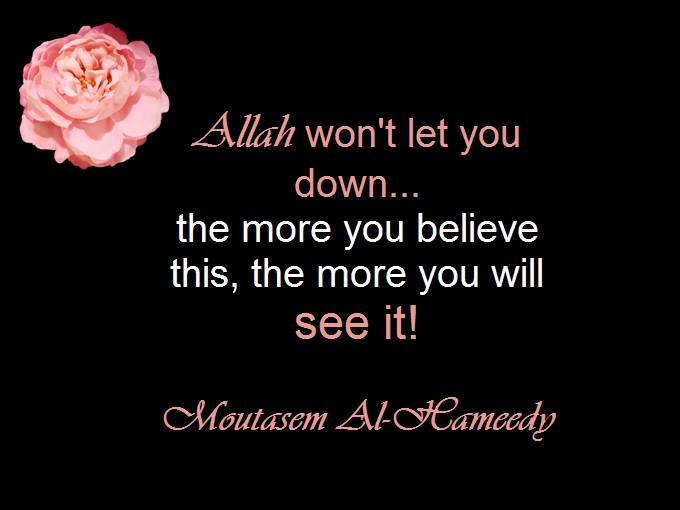 Whilst you have trust in Allah there is an element of deep sadness due to a calamity. I hear conflicting views. Some say as a believer you shoudnt be sad for very long and snap out of it because its something which has been decreed by Allah and some say that sadness is ok as its normal and give the example of the father of Prophet Yusuf who was extremely sad but placed his complete trust in Allah. I mean he was so sad that it led him to become blind. So how should one deal with sadness and does it conflict with having trust in Allah if one is sad for very long due to his/her emotional connection with the person?